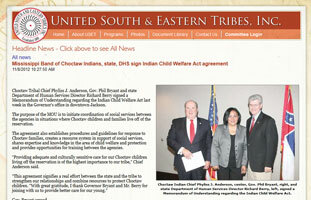 In October 2012, the Mississippi Band of Choctaw Indians and the Mississippi Department of Human Services signed a Memorandum of Understanding (MOU) related to the Indian Child Welfare Act. The purpose of the MOU is to initiate coordination of social services between the agencies in situations where Choctaw children and families live off of the reservation. The agreement also establishes procedures and guidelines for response to Choctaw families, creates a resource system in support of social services, shares expertise and knowledge in the area of child welfare and protection and provides opportunities for training between the agencies. Read more from the press release at the United South & Eastern Tribes website. See the full te xt of the MOU and other Mississippi resources in the NARF ICWA Guide Online. This entry was posted in Laws and Regulations and tagged Mississippi, Mississippi Band of Choctaw Indians. Bookmark the permalink.